Ella Miles | I'm Starting a Blog! So I've decided to start writing a weekly blog so that I can give you more updates about my books, behind the scenes info, teasers, deleted scenes, and random info about myself. Exciting right? Okay maybe not that exciting, but I’ll do my best to try to write about something that I think you will find interesting every week. This week I wanted to talk to you about my name Ella Miles. As some of you may know, Ella Miles is not my real name. At least it is not the name that I was given at birth. 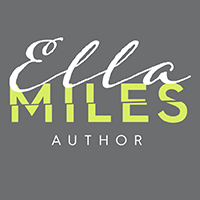 Ella Miles is a pen name. When I first started writing the summer of 2015, I wasn't sure if I was going to be any good. In fact, I thought I might be horrible. I think most writers feel this way and have loads of insecurities that they deal with. At least, I do. So in order to be fearless in my writing I decided I would write under a pen name instead of my real name. And if my writing sucked I could just delete the books and the pen name. No harm done. Nobody would know it was me. I also wasn't sure my real name was the best choice anyway because my last name isn't the easiest to spell. In fact, after I got married my own father spelled my last name wrong on several occasions. So after several days spent thinking about a name I would be happy with I came up with the name Ella Miles. I chose Ella because the first book I fell in love with as a child was Ella Enchanted. And I chose Miles after my husband who was my first supporter. He's also my tech guy so blame him for any problems using my website or email. I'm also one of the biggest introverts on the planet but I am trying my best to be more social at least on social media. I just recently began an Instagram and Pinterest and have no idea what I'm doing but am having fun figuring it out and would love your help. So please follow and like my pages! Win all of my books in signed paperback or ebook format! And win an ARC of one of my upcoming releases! To enter all you have to do is like or follow me on any social media! Winners will be chosen at random throughout next week.